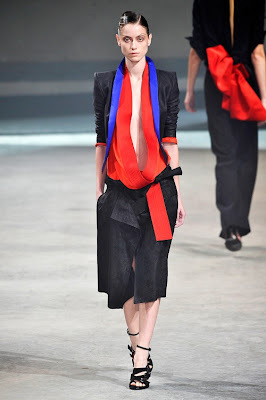 Haider Ackermann showed a stunning collection for spring. 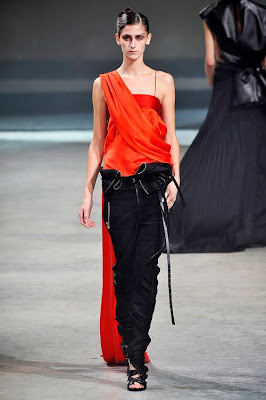 All the elements, from the palette of bright, warm colors set against black, to the deconstructed motorcycle jackets, to the super-revealing yet somehow elegant dresses with cutouts were perfectly executed. I think the relaxed vibe of the clothes takes away some of the "barely there" vibe of some pieces; it's not so much about exhibitionism but about the negative space within the clothes. The exotic vibe may have come from the teals, mustards and turquoises but there's something about the loose silhouettes that recalls slow long-distance travel (I don't think I'm projecting that much). Haider always exudes a dark romanticism and I think he has been the most successful in transmitting that message to us this season. No wonder he got a standing ovation at the end of the show! Stripes can be everything in an outfit!